There are many top-rated razors which are obviously varied and attractive also. So, it is tough to find the abject one. For that, you can choose them based on your skin type, sensitivity, facial hair type, and personal preference. An electric razor can make one free to his shaving work. But when a men has sensitive skin, he may also suffer some discomfort even from an electric razor. If you try to choose the only one, then it will be tough. There are so many shavers with two/three/four/five blades; foil or rotary; wet and dry; precision heads; flex motion etc. It is so confusing to choose the perfect one inside them without trying them all. To solve this problem, you can follow some website like ours, which can provide you with detailed lists and reviews. After a great research and personal testing, our review team enlisted some razors which are much comfortable for sensitive skin. You can easily find the best one for your super sensitive skin that provides a clean and smooth shave with full of comfort. Let’s find out, which one is the best electric shaver for sensitive skin. Braun is a popular brand for electrical products, especially for electric shavers. Their Series 9 launched back in 2015 as the company’s new flagship. The shaver was highly anticipated all over the world. You may surprise to know that, it was just one year after their big launch, Braun rolled out an explicitly much update with their new Series 9. For this, here caused a lot of fuss and confusion with that. After and before the update, there some shavers are really good. Before update they used to take 90xx template. The 9095cc is mentionable for the sensitive skin. After the update, they use 92xx template. In this time 9290cc is remarkable. Now, let’s see how can they effect in shaving performance. The most noticeable object is the titanium coated middle trimmer. The hyper lift and cut trimmer used in 9095cc as blue colored and distinct golden colored in 9290cc. This is a novelty and important element in Braun series 9. They designed trimmers lift like this so that it cut the flat-lying hairs. It is important to know about titanium coating that is actually titanium Nitride, which has a gold metallic color. They are really excellent in cutting thick, unkempt beard without any irritation. Its efficiency in trimming makes it very easy to use for everyone. It comes to aligning the device to the contour of your face perfectly. There also used two foils here, which called optifoils that shave hairs too closely. Braun used hexagon shaped holes to capture more hairs compared to the regular rounded perforations. Series 9 used a direct cut so that, it cut all the hairs which grow in different directions. There also used 5 SyncroSonic technology elements. For this, it captures more hair than any other premium razor. The technology is able to read the density of the beard and depending on this, it adjusts the power accordingly. For this, we can call this SyncroSonic technology. The Braun series 9 included a 10 directional pivoting head, which is something different from other. With this head, the cutter can independently move and the whole shaving head can also pivot back and forth. Personally, I think, the Series 9 9095cc has one of the best flexing shaving heads of any other foil shavers. You are able to lock the head into a fixed position. And it’s with a better switch, which is located on the front side of the shaver. Now here is good news for you. Updated Braun series 9 is totally suitable for the wet and dry shave. And it is able to work under the water up to 5 meters. That means if you want to use it on the shower, you can do it undoubtedly. You are also able to use your favorite shaving cream or gel. And if you want to use it dry, it has no problem. So, this is excellent for a sensitive skin. All of Braun Series 9 electric shavers include a cleaning station with their instrument box. But at first, you have to manually clean it and dry before tossing into cleaning base. This defies the purpose of having an automatic cleaning station completely when you are planning to use shaving gel or cream. Braun 9290cc comes with an LED display; where with the other models there is no way to know about the battery life. And the display also shows the running time left, as well as its hygiene level. Not only this, but it also shows the number of minutes which are left before it runs out of power. The LED screen use to display the information like the amount of battery charges. To remember you, who is the maker of your shaver, the Braun logo is just below the LED screen. The shaver takes only one hour to full charge. After charging this, you can continuously use this for about 50 minutes. You can also use this for more than one week. It totally depends on your needs and demands. It could be a good option for you because there is a fast charging switch included here. As a safety precaution, Braun series 9 can’t be operated while charging. Don’t worry; the shaver is equipped with a strong quality based battery. So, there is no option here to lose the charge in shaving time. No one is going to argue with that the Series 9 is Braun’s best electric shaver. I am damn sure, you will obviously love this series. Because Baun offers some superduper offerings. Personally, I recommend the Braun Series 9 shaver which is totally able to give you the most comfortable shave ever. This shaver is perfect for daily shaving and also very good for sensitive skin. If you are looking for great shaver which can give you a decent looking shave, then Braun 9 Series is the best choice. The razor feels like relatively much faster, smoother and overall very pleasant to use. Philips Norelco is a famous electric shaver brand for their rotary type shavers. Actually, they are the dominating producer of electric shavers of their type(rotary shavers) on the market. The Philips Norelco 9000 is their newest release and most advanced electric shaver. 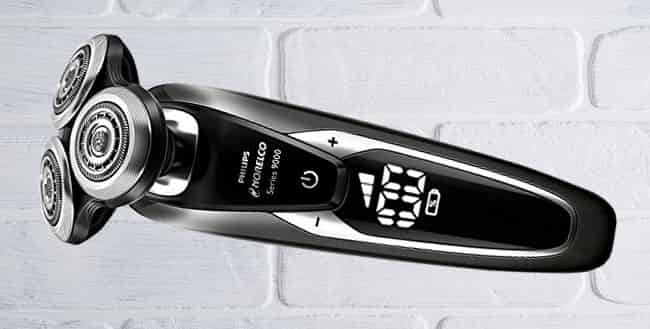 While it comes to best electric shaver for sensitive skin, the Philips Norelco 9000 is only one shaver which can compete with the Braun Series 9 on the market. But while talking about the rotary types shavers, there is no nearest competitor of Philips Norelco 9000 on the present market. The built quality of Philips Norelco 9000 seems that this shaver has been specially designed for sensitive skin. The design and build quality of the shaver has achieved the IF design award 2015 which is recognized all over the world. The shaver has a sleek fully black design with a rubber grip on the back side for what the shaver really looks like a premium shaving machine. The blades of the shaver are made with chromium steel which is self-sharpening. The Blades come with ultra-modern V-track pro precise to cut hairs 30% closer which is much effective in 1-3 days beard. The V-track precision blades ensure the most premium close, smooth and comfortable shave within every 1-3 days. The shaver has the unique contour detect technology to follow every angle and curve your face. The contour shaving head flexes in 8 directions to ensure ultimate shaving comfort in every pass. For this technology, the researchers and users sealed this shaver as the best electric shaver for sensitive skin. The advanced contouring detect technology helps the shaver to catch 20% more hairs in every pass. The rotary shaver performs outstandingly on 1-3 days beard. If you have a big beard older than 3 days, there is a trimmer head with the shaver to trim the long hairs before the shave. You can simply pull the rotary head and set the trimmer head to cut the long hairs and make them shorter to shave with the shaving head. For this, the trimming head is very useful. The trimmer head also can be used to leave a final touch to your mustache and shape your sideburns. Recently, Philips added a brush head with their Philips Norelco Series 9000 shaver to smoothly brush your face after and before the shave. And also you can have a gentle brush on your face anytime to make your face clean and germ-free. The shaver has a very powerful motor to provide the fastest and most advanced shave in every strike. There are two buttons beside the power button(left and right) indicating (+) and (-) sign. The buttons are to set the power of your shave according to your demand. If you have a sensitive skin, you can reduce the power to have a comfortable operation, and if you need a thorough shave every day, you can choose the medium power setting. But if you need a quick and thorough shave, you can select the fast shaving mode. This power customization settings of the shaver picked it on the top and facilitated as the best electric shaver for sensitive skin. The shaver comes with a powerful Lithium-ion rechargeable battery which provides 60 minutes of shaving power in every 1-hour full charge. That’s I think the best feedback from the batteries. The shaver also has a quick charging option to have a charge in 5 minutes for a quick full shave. The power system supports worldwide voltage (100v-220v) which ensures that you can use it anywhere in the world. The Philips Norelco 9000 electric shaver has a SmartClean PLUS system to clean the shaver automatically after every use. The SmartClean system charges the shaver too while cleaning. So, you do not need to use the power cord to charge the device from the direct electricity. It does not mean that you can not charge the shaver with the power cord direct. Rather you can charge the shaver with both systems (with cleaning dock or direct power cord). On the front of the shaver, there is an LED display to show the battery status of the shaver, when need to charge, the cleaning indicator and the replacement head indicator. The shaver Philips Norelco 9000 and all of its parts are fully waterproof, so you can clean the shaver and the parts directly from the running water as a manual cleaning. To save your cleaning cartridge, you can clean the shaver directly with water. You can do a manual dry clean with the cleaning brush provided with the electric shaver Norelco 9000. Just pul the shaver head and detach the parts and smoothly brush them out to easily clean the shaver. For being 100% waterproof the shaver is very suitable for the wet/dry shave. You can have a dry shave without any material very quickly. And you can have a refreshing wet shave with your favorite foam, gel or soap for a comfortable shave with the shaver. You can have a shave while bathing under the shower as the shaver is showerproof. There are very few electric shavers which have the AquaTec Technology for a wet/dry shave and also the V-track blades for a close and smooth shave like the Philips Norelco 9000. For some special new technologies for sensitive skin of this shaver, I can say that it would be the best electric shaver for sensitive skin if you like to have a rotary type shaver which performs in a circular motion. As the motor of the shaver is ultra powerful and very fast, it makes some noise while shaving. It could be a downside of this shaver if you do not like the sound of a shaver while operating. For more information about the Philips Norelco 9000, I think you should view our Full Review with the pros and cons of this shaver. In the shaver industry, there are three major shaver companies are renowned. Panasonic is one of them. The Arc5 is Panasonic’s high-end line, currently at the third generation. They featured here a massive 5-blade unite. In September of 2015, the third incarnation of the arc5 family debuted. The popular models of the arc5 series are arc5 ES-lv81-k, ES-lv65-S, and ES-LV95-S. Note: The arc5 ES-LV81-k is the older model with an automatic cleaning and charging station, the arc5 ES-LV65-S is the newer model without cleaning and charging station and the arc5 ES-LV95-S is the newer model with an updated automatic cleaning and charging station. The arc5 is an award-winning series by Panasonic for its super-sharp hypoallergenic 5-blade shaving system and 30° precision-honed system of the blades to provide super-comfortable and smooth shave in every pass. This shaver is extremely suitable for men who have a very sensitive skin for this technology. The built-in 5-bladed shaving sensor of the arc 5 can detect the beard density and beard type to catch more and more hairs in every pass to provide ultra-close shave. The blades are super thin and as sharp as you can not sense the operation that something is cutting your hair but having a close shave without any irritation that could be the main responsible for a super comfortable shave in a sensitive skin. For its hypoallergenic system, the blades remain sharp day after day and provide the long-lasting performance. Panasonic designed the foil caps with angled holes in their arc 5 shavers to capture the hairs smoothly and give a great protection for a sensitive skin. The three different types of five arcs have three different functions to ensure a close, smooth and comfortable shave. The outer foils of the head both side of the shaver are called “Finishing foils” which are responsible for capturing and cutting the stubborn hairs. Inside the finishing foils, there are two “Lift-tech foils” to cut flat-laying hairs and in the middle, there is a “Quick Comb Blade” to capture and cut long hairs (View full reviews of Panasonic Arc 5 shaver to know details about the foils). After assembling all together, the shaving head is perfect for giving an outstanding smooth performance. The Panasonic arc 5 shavers have multi-flex pivoting head to hug your face from every angle to cut any kind of hairs. The head pivots 25° front and back, 20° left and right to balance the shaving angles of your face like the neck, under the chin area and the jawline. 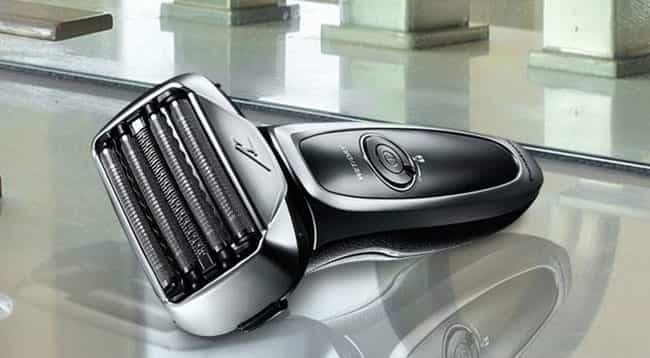 The Panasonic Arc 5 ES-LV81-k, ES-LV65-S, ES-LV95-S used a high power linear motor which performs 14,000 cycles per minute to provide faster and smooth shaving at per pass. The super powerful motor provides 70,000 cross-cutting actions per minute with the 30° angled stainless steel nanotech super sharp blades. #Wet/Dry Shaving, Washability, and Cleaning. All of the arc 5 shavers are 100% waterproof and provides wet and dry shave facility. Where you can use your favorite foam, gel, antiseptic cream or soap for a wet shave and also have a direct shave under the shower. 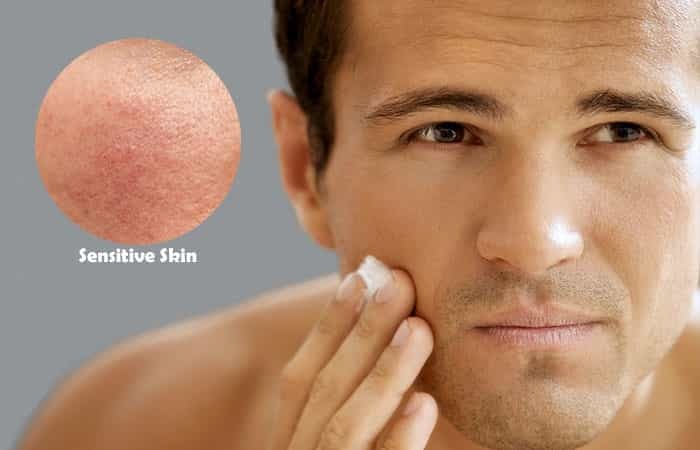 You know, the wet shave is very suitable for sensitive skin and we do not recommend to use the harsh shavers which do not provide wet shave at all. You can have the dry shave too with the shaver when you need and that will not hurt you even in the dry shave, trust me. After every wet shave, we recommend cleaning the shaver which will make it germ-free and ready for the next use. Panasonic provides automatic cleaning and charging station with the arc 5 ES-LV81-k and the ES-LV95-S which will automatically clean and dry the shaver. But there is no cleaning station with the arc 5 ES-LV65-S.
As the arc5 shavers are 100% washable, you can clean the shaver easily without any cleaning dock. Just open the foil cap with one click and rinse the shaver under the running tap water(warm water is better). If you do not like manual cleaning but like the Panasonic LV65 shaver’s features and design, you can choose the Panasonic LV95 instead. The model and design of both shavers are almost the same and only the difference is the cleaning and charging dock. #Battery, Charging and Run Time. Panasonic used very powerful batteries in their arc 5 series which are in Lithium-ion. With a 1 hour full charge, the lithium powered battery provides 45 minutes of performance fuel. I think this is really great for a cordless shaver. The adapter adequates with universal voltage (100-220v) for charging which could be used worldwide. So, you do not need to worry about your country voltage and also others while traveling. The arc 5 shaver which has cleaning and charging station, you can put the shaver into the dock and which does not have any cleaning and charging dock, you can charge it directly from the electricity by the charging cord. There is a quick charging option too in the arc 5 shavers and you can charge it within 5 minutes when your battery is fully dead and you need an urgent shave. As it is a wet/dry shaver and also provides 5 minutes of quick charging option, we highly recommend to not use the shaver while charging. It could be risky to use the shaver corded and Panasonic also says that. A remarkable matter in the arc 5 shavers is that, the arc 5 shavers come with LED indicator display to show the remaining battery life, performance time and when need to clean. This feature is very useful for a precaution. All the Panasonic arc 5 shavers have a precision built-in pop-up trimmer for a final touch. The Popup Trimmer helps you to shape the sideburns and mustache and also remove the unwanted hairs after shaving. Quality of the popup trimmer is really premium and provides a smooth and comfortable result. You will love that amazing extra feature after every use I guarantee. In every angle, the Panasonic arc 5 shavers are highly suitable for the sensitive skin and who want a smooth and clean shave. You can choose one model from the three I mentioned after seeing the note I added before at the top of the arc 5 review. For more details, view our full reviews with pros and cons. Braun series 5 is another top listed electric shaver series by the giant company Braun. While thinking about the best electric shaver for sensitive skin, the Braun Series 5 comes before the popular series 7. Because the Braun series 5 take cares of more skin contact for the more comfortable shave. 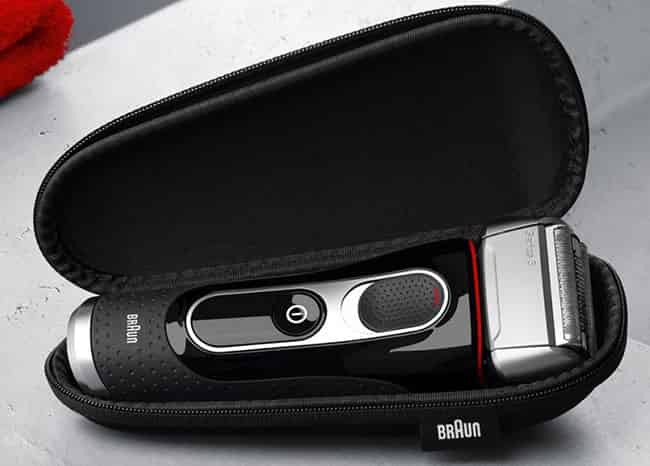 The Braun Series 5 5090cc/5190cc is the main shaver model of this series. This shaver comes with an ergonomic design with ultra-soft rubber grip to protect the shaver from accidental falling down from your slippy and wet grasp. The Braun Series 5 5090cc/5190cc achieved the official recognization from NFL and declared this is their official electric shaver. 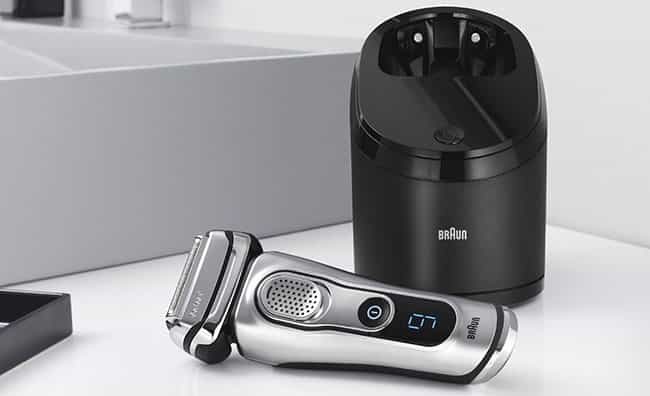 The world’s number #1 foils shaver brand Braun has engineered this shaver for special comfort to provide ultimate comfortable shave on the sensitive skins. Braun Series 5 5090cc/5190cc electric shaver has 3 ultra-sharp foil blades with 2 SensoFoil guards and 1 ActiveLift trimmer to protect the skin from the blades. The foils come with FlexMotionTec technology to provide more proficient shave in every pass and minimize skin pressure to prevent skin irritations. This technology makes this shaver the best electric shaver for sensitive skin. For this technology, the shaver performs a super-sharp operation but your skin cannot feel the stroke. As the foils move individually to adapt with the skin contact and face angles, you will feel a soft and smooth operation in every pass and get a relaxed shave. The 2 SensoFoils cut the stubble for the super close shave and the ActiveLift middle trimmer cuts the flat-lying hairs for a smooth operation. The shaver head moves in 8 directions to follow every contour of your face and reach everywhere even the hard to touch areas for a smooth and perfect operation. The contouring technology provides more skin comfort for the sensitive skin and ensures the super-close shave. Braun Series 5 5090cc/5190cc electric shaver comes with a super powerful AutoSensing motor drive which can adapt with the beard density and cut thin to thickest beard in every pass. According to the beard density, the motor power increases and decreases for the perfect and efficient shave. #Washability, Wet/Dry Shave, Cleaning and Charging Station. The Braun Series 5 5090cc/5190cc is 100% waterproof shaver. So, you can clean the shaver with direct running water for an easy rinse. And this is a wet/dry shaver which offers refreshing wet shave with your favorite shaving foam, shaving gel, shaving cream, soap or water. For a hygienic wet shave, you can use antiseptic creams or lotions for the wet shave. For an easy and fast dry shave, you do not need to be an expert in shaving. Just start the shaver power and have a dry shave within minutes. For being 100% waterproof, you can use the shaver for the shower shave under the shower while bathing and you will not face any water caused problem with the shaver. The rubberized grip of the shaver will protect it from accidental falling down while taking a wet shave or using under the shower. The grip of the shaver feels super comfortable for its soft and secured rubberized finishing. Braun Series 5 5090cc/5190cc shaver comes with an automatic cleaning and charging station which automatically cleans, charges, dries and lubricates the shaver and make prepared for the next use. For the hygienic operation, you need to put the shaver into the cleaning and charging station after every use and it will automatically clean and make the shaver germ free. The Braun series 5 5090cc/5190cc electric shaver is powered by a powerful Lithium-ion battery which provides 50 minutes of cordless operation with every 1-hour full charge. That means you do not need to charge the shaver after every use even you need to charge the shaver after 5 – 7 shaves. There is a quick charging option in the shaver which offers an urgent shave while the battery is fully dead with 5 minutes of charge. There is an LED display to show the battery status, charging status and hygiene status of the shaver. The Braun Series 5 5090cc/5190cc has a built-in pop-up trimmer which offers a detail trimming of your beard and mustache and size your sideburns and eyebrows. The pop-up precision trimmer is really good in quality which competes with the premium pop-up trimmer of Braun Series 9 shavers. The price of this shaver is very reasonable according to its quality. In my opinion, this is the most reasonable and smartest electric shaver for sensitive skin. I did not find any downside of this shaver even after 1 year of use. If you find any problem with this shaver, you can let us know with a comment below. According to Philips Norelco’s proclamation, the Philips Norelco 7500 is their best product for sensitive skin type. They said that they have specially designed their Norelco 7500 shaver for great performance on the sensitive skin. The shaver achieved the maximum score for comfortable shaving in any kind of skin type in the Philips Norelco’s line. The shaver Philips Norelco 7500 comes with Gentle Precision Blade System which offers maximum comfort while operating on the sensitive skin. It ensures the closest result with the least skin irritation. Philips used Comfort Rings system beside the rotary blades to reduce friction while performing. Since the blades are very sharp, it can deliver smooth shave very quickly without pulling hairs. The rotary blades and head are dynamically flexible which can easily adapt with your skin contact and move to any curve of the face. The shaver comes with AquaTec technology which offers any kind of wet and dry shaving anywhere. The technology has been added to make refreshing wet shaves with preferred shaving lubricant or water. Philips made this shaver 100% washable and water resistant. For that, the cleaning process is very easy to easily rinse the shaver. Since water resistant, you can shave with the shaver under the shower while bathing. The package comes with a smart cleaning unit to clean, lubricate and charge the shaver automatically with a press of a button. This attachment helps to keep the device contamination free. The shaver runs with a powerful Lithium-ion battery which offers 50 minutes of cordless shaving with 1 hour of full charge. There is a quick charging option to have a full shave with an urgent 5 minutes charge. On the shaver body, there is a 5 stage LED display to show the battery level status, battery low status, travel lock status, cleaning alarm and replacement head alarm. There is a SmartClick precision trimmer head with the package to trim the long hairs and also make perfect edge lines on the beard and hair. It is very helpful to size the sideburns and mustache. In the rating of sensitive skin type, it deserves a better place in a listing of best electric shaver for sensitive skin. There are both positive and negative feedbacks by the consumers but no one has any objection about the skin irritation.